Part of the team who visit the Greene County Adult Detention Center in Xenia, Ohio, each month. From left to right are: Tom Craft, coordinator; Mark Combs, pastor; Lee Bradley, elder; and Dorsey Marable. Calvary Grace Brethren Church in Kettering, Ohio, is a small church with a big heart for discipleship and missions. 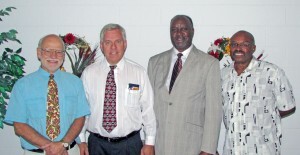 About 14 years ago, the men at Calvary Grace started visiting a prison in central Ohio. Every fourth Sunday, they hold a service at the facility, sharing the gospel message and spending time with the inmates. It has impacted the fabric of the church. “It’s pretty rare that we don’t have at least a couple first-time decisions for Christ,” said Mark Combs, pastor at Calvary. Combs – who grew up attending Calvary – and his father, assistant pastor Harold Combs, focus on preaching God’s word and discipling the church members instead of increasing membership or executing elaborate programs. “We’ve got to be faithful to what God’s called us to do,” Combs explains. “I see our church members taking the great commission very seriously; and their faithful giving just amazes me for such a small group. This story first appeared in the GraceConnect eNews, Week 12, September 9, 2013. To subscribe to the eNews, see the orange box in the upper right corner of graceconnect.us.